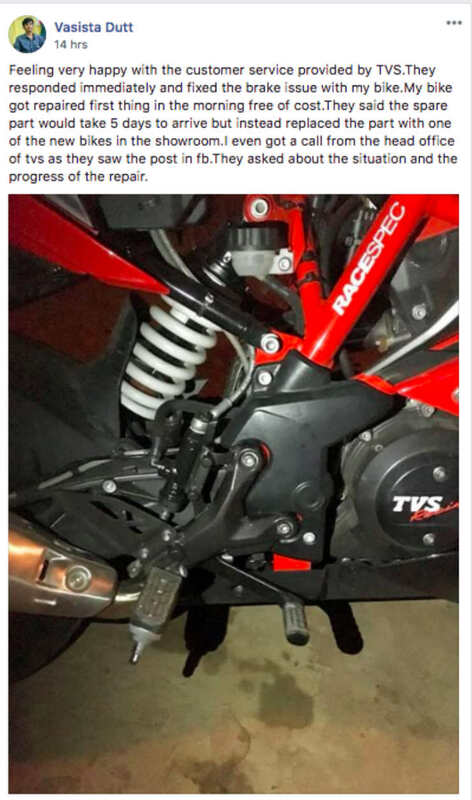 Just yesterday, a disgruntled customer of a TVS Apache RR310 had posted on social media about the brake pedal falling off from the bike abruptly. The post mentioned that the bike is only 600 km old and was not ridden above 90 km/h. Vasista Dutt, the owner, also posted pictures of the brake lever that showed that the bolt from the brake pedal was missing, causing the brake lever to get separated from the bike. Earlier today, Vasista Dutt posted a new picture of the fixed bike and thanked the TVS team for their prompt service time. The customer said that he is happy with the customer service of TVS who responded immediately and fixed the bike on priority. The repair job was done free of cost. Feeling very happy with the customer service provided by TVS. They responded immediately and fixed the brake issue with my bike. My bike got repaired first thing the morning free of cost. They said the spare part would take 5 days to arrive but instead, they replaced the part with one of the new bikes in the showroom. I even got a call from the head office of TVS as they saw the post on FB. They asked about the situation and progress of the repair. TVS Apache has become quite popular in the Indian market and the bike comes with a long waiting period. It is a one-off case where the bolt holding the gear lever may have become loose causing the lever to fall. Till now, TVS has dispatched thousands of Apache RR 310s in the Indian market and none of them has faced the issue or has reported the same online. The Apache RR 310 is a fully-faired bike based on the upcoming BMW G310R. It is the most expensive bike from the manufacturer in India and priced at Rs. 2.23 lakhs, ex-showroom. The bike gets many futuristic features like the reverse-inclined engine that enables the bike to get a shorter wheelbase with a longer swingarm. It is powered by a 311cc engine that generates a maximum of 34 Bhp of peak power and 28 Nm of maximum torque. It also gets twin-channel ABS as standard.